Sir Francis Galton lived in England from 1822 to 1911. He was a Victorian gentleman, a cousin of Charles Darwin, and a multi-hyphenate anthropologist, inventor and mathematician. His accomplishments include developing the statistical concept of correlation and regression to the mean, devising the first weather map and inventing a method of classifying fingerprints. He was also responsible for coming up with the term ‘Nature vs nurture’, and was a pioneer in Eugenics, the study of human genetic development and improvement. In 1906, while visiting a country fair, he came across a contest that intrigued him. An Ox was on display, and the crowd were invited to guess the weight of the beast. Galton collected all seven hundred over tickets after the contest was over and tabled the results. While none of the guesses were correct, he was shocked to discover that the median of all guesses was 1207 pounds, a mere 0.8% more than the actual weight of 1198 pounds. More surprisingly, he found out that cumulatively the crowd was even closer, and that the average of all guesses was 1197 pounds, a mere one pound off the actual weight. In his 2005 bestseller The Wisdom of Crowds, James Surowiecki provides compelling argument about the wisdom of group decision making. Individuals interpret information independently and this diversity of opinion when aggregated results in decisions that are on the whole better than what any individual, experts included, can come up with. He suggests that an understanding of the mechanism behind the wisdom of crowds and proper application could lead to better businesses, economies, societies and nations. The financial markets is all about predictions. We want to know where the STI is headed. We want to know where Gold is headed, where interest rates are headed, where individual stocks are headed. We want to know when the next correction or crash is coming so that we can know when to buy in or sell out. The market understand our need for direction. Analyst reports and predictions are churned out with amazing frequency. Now if crowds are indeed wiser than individuals and a crowdsourced decision better than one made in isolation, is it not a simple enough matter to consolidate the opinion of analysts to determine where the market is headed? Bloomberg did just that. In a long running survey, Wall Street analysts were asked on a weekly basis, their recommended portfolio weightings in stocks, bonds and cash. The rationale is simple. When the market is bullish, analysts would recommend a higher percentage of the portfolio to be in stocks and lesser allocated to bonds and cash. 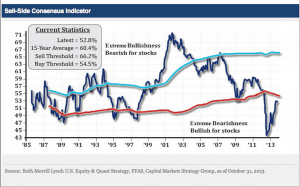 When analysts become bearish, they would recommend a more defensive portfolio with lesser allocation to equities. The analysts made up a ‘crowd’, and their recommendations were tabulated. 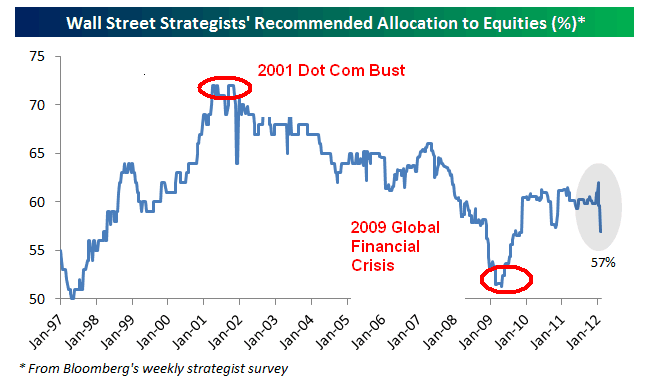 In 2001, at the Dot Com Bust analysts were extremely bullish and recommending a portfolio with equity weighting in excess of 70%, the highest ever. The next three years saw S&P 500 declining more than 40%. Even more telling, in 2009 just after the collapse of Lehman Brothers heralded in the Global Financial Crisis, analysts collectively made a pitch for just over 50% equity allocation in their portfolio, the lowest in a decade. We all know that the market recovered swiftly and sharply. Taking the analysts recommendation would mean taking a big hit on the portfolio in 2001 and missing out on a bull market lasting almost five years till date. If a motley crowd put together could get the weight of an ox right 100 years ago, surely this group of experts put together, with their collective wisdom should have no problems getting the market direction right. This is after all a consolidation of hundreds of analysts from the biggest financial institutions in Wall Street. They have the biggest data, the best research teams and the latest news at their fingertips. Shockingly they were not slightly off in their predictions, but resoundingly and unforgivably wrong. An investor would be better off totally disregarding their recommendations. Or would he? Savita Subramanian is the Head of US Equity and Quantitative Strategy at the Bank of America Merril Lynch Global Research. According to her CV, she responsible for recommending US Sector allocations for equities and determining forecasts for S&P500 and other major US indices, as well as developing and marketing the firm’s quantitative equity strategy to institutional investors. (As far as titles and responsibilities go, that is about the furthest it can get for an analyst). Savita is also responsible for mantaining the BofA Sell Side Indicator. 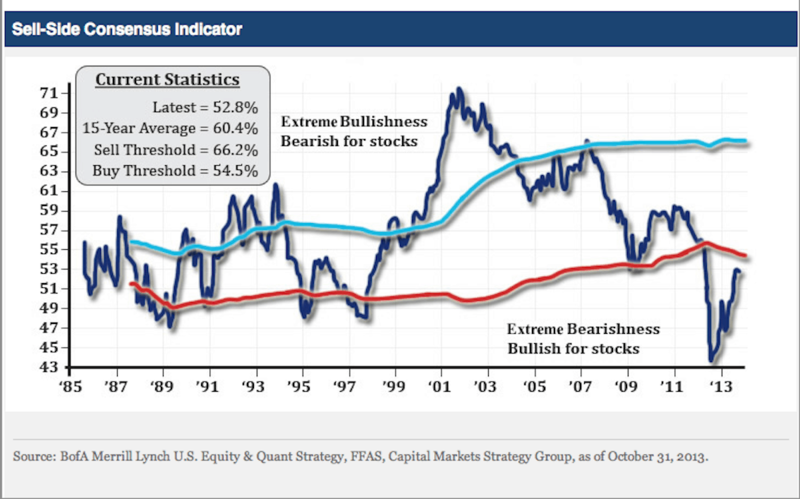 The Indicator is based on the average recommended equity allocation of Wall Street strategist at the last business day of each month. This is exactly the same consideration as the Bloomberg survey – a bullish analyst would recommend more equities while a bearish analyst, less. However the entire logic is now flipped on its head, turned inside out and reversed 180 degrees. A collective bullish outlook is now taken to be a sell signal while global bearish consensus screams buy. So now we have an analyst trying to predict the market by consolidating predictions from the entire universe of other analysts (the crowd), negating their predictions entirely and forecasting the market to go exactly where all other analysts say it isn’t going. I hope the irony is not lost on you. There are two points I want to bring across in this article. Firstly, do take all predictions with a pinch of salt. It is tough, especially when predictions come packaged in glossy reports backed by figures and data and extensive research. Or when analysts show up all decked out in expensive suits and spouting complex financial jargon. But as we have seen in the above instances, the magnitude of error in their predictions can be shocking. In any other industry it would have been totally unacceptable. I cannot imagine doctors misdiagnosing cancer, engineers overestimating structural loads, or lawyers putting forward arguments that advance the opponent’s case, all on a regular basis. Unfortunately it seems that the financial markets are more complex than human bodies, mega structures and the nuances of legality that only lawyers are capable of seeing. Secondly, do not time the market. Timing the market is the hardest thing one can do. Analysts cannot get it right. Crowds of analysts cannot get it right. I can never get it right and I highly doubt you can. What is key here is understanding and accepting that fact. 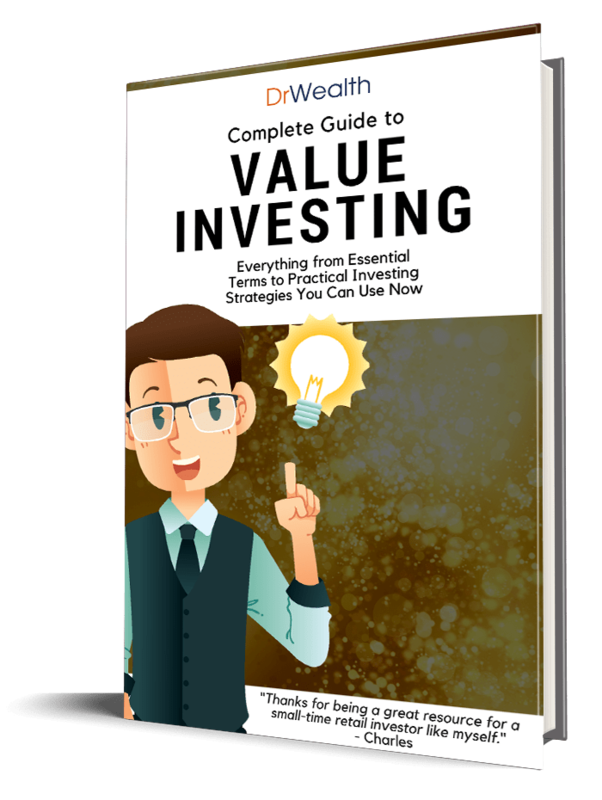 There are other ways to make money without timing the market. You can read about it here. May 2014 be a great investing year for all!